Cat LeBlanc is a Business Strategist & Venture Catalyst. Which means she has an uncanny talent for turning your brilliance into a profitable (& liberating) business. This blog post is 6,508 words. You can get all 12 tips on how to start a consulting business including real life examples and templates in a checklist format as a PDF download. Get it right here. It’s FREE. …even if YOU have no experience. Whatever you do in your work or even in your play or home life, you’re an expert in something. Whether you’re an expert in helping businesses understand the impact of their cash flow or an expert in getting babies to sleep through the night, someone out there needs your expertise. But when it comes right down to it, many people starting a consulting business, coaching or practice online struggle because they don’t take the time to get the basics right. Yes, you need to have a website and a Facebook page (eventually) and you might need to start a blog or an Instagram account. Find a client, offer outstanding value, and repeat. If you can accomplish those three steps, you can start a successful online consulting business – in any market. That’s why I dug deep into my own experience as a startup consultant and asked some of my go-to experts for their best tips and created this guide to starting a successful online consulting business. These 12 tips below may seem a little basic, but you’ll find that if you practice them, you’ll have more happy clients than you know what to do with. Each of the tips below comes with a set of action steps to help you put it into practice in your own business. Choose which tips you’re going to follow, and put the action steps into your calendar or to do list today. There’s no better time to start than the present. Tip 1: Employ The Briefcase Technique to impress potential clients every time. Tip 2: Leverage your existing network. Tip 3: Offer free consultations. Tip 4: Approach a small group of potential clients individually. Tip 6: Connect with influencers to stand out. Tip 7: Speak from stage. Tip 8: Leverage LinkedIn as your personal KLT goldmine. Tip 9: Run a high quality webinar or free training. Tip 10: Create outstanding content. Tip 11: Hang out where your clients are. Tip 12: Forget what everyone else is telling you and follow your intuition. When you’ve got a client interested in your services, you can use one of my favorite selling tips, which comes from Ramit Sethi of I Will Teach You to Be Rich. It’s a wonderful way to sell your consulting services without ever feeling salesy. He recommends preparing for a pitch meeting or new client meeting by looking at all the problems you can solve in their business, and then drafting a full proposal on how you would fix them. This is powerful because it demonstrates that you have an understanding of their business and problems and that you’ve already put the time, thought, and effort into figuring out how you could solve them. Very few people will pitch a new client in this way, so even if they’re considering multiple consultants, you will stand out. Research your potential client – what are the problems you expect that they are experiencing? Of all the problems you can find what are the most pressing that have the greatest benefits? Choose the top 3-5 problems and write up how you would solve these should you and the client work together. Put this into a proposal for the client. Ramit says the document should read like a tantalising menu to the client. Think: what would get them really salivating? Instead of calling your document Client X Proposal, call it something that clearly communicates the main benefit to the client of working with you for example Client X Strategic Growth Plan. Build in time for research and preparation before every potential client meeting to draft your briefcase proposal. It’s hilarious to me how many people start a business – and act as though it’s a big secret. They shy away from even telling their friends and family members what they’re doing, or asking for referrals from the people who know and love them best. I also completely understand the feeling and I admit I did something similar when starting my own business. However, as an older and wiser business owner, now I encourage my clients to do the opposite. After all how can anyone hire you if they don’t know what you offer? According to the New York Times, on average 65 percent of business for small business owners come from referrals, and the Nielsen company tells us that people are four times more likely to buy when referred to a service by someone they know. These kinds of statistics don’t lie. Referral marketing is incredibly powerful – especially when you’re just starting out. I recommend you tell everyone you know that you are starting your consulting business (in a non-salesy way – see the email template below) and ask them to let you know if they know anyone who might be interested. You’ve heard of the six degrees of separation? This is all about putting the theory to work for your business. You never know who your Aunt Sally may be friends with who could end up your next (or first) big client. My friend Lacy Boggs, director of The Content Direction Agency, started her career as a professional ghostblogger by telling friends and contacts that she was hanging out her digital shingle – including mentioning it to a business coach she had met at a networking function. That business coach turned around and recommended Lacy’s service to one of her coaching clients, resulting in Lacy’s first client, and first $2,700 paycheck. Take the time to make out a list of people you know. Include friends, family members, and even acquaintances. I hope this email finds you well! I wanted to reach out because [remind them how you know each other], and I knew you would be interested in my new venture. I’ve just started a consulting business that helps [your ideal customer] to achieve [your amazing result]. I do this by [your special sauce, proprietary process, etc.]. If you or anyone you know might be interested in this, I’d love to chat. Are you available for a quick call [suggest a time and date OR use a scheduling website]? If you don’t know of anyone right now, I hope you’ll keep me in mind in the future! Make note of anyone who expresses interest or indicates they might have a referral, and FOLLOW UP. Consultants in particular need to be able to back up their claims with the kind of results they get. But how do you show results when you’re first starting out? One way is to offer free introductory consults in your area of expertise. This is especially good if you can focus on one way you can get tangible results in a short period of time. The length of time is ultimately up to you. If you can make valuable recommendations to people in 15 minutes, wonderful. If you need an hour-long conversation, do fewer, but make sure the results you provide are out-of-this-world. Start generating hot leads for your online #consulting biz in 15 minutes with this tip! Your goal with these sessions is to provide two kinds of value. First, you’re delivering information-based value, actually solving a problem for them, even a small one. Second, you’re offering decision-based value, because simply by being on the phone with you, you should make them see how important the issue is. Most people will, at the very least, ask about how they can work with you. As a new consultant, you’ll also gain powerful experience from each and every call, both in applying your skills to different problems, and in getting more comfortable with selling. The key is to pick a single area of focus for the call where you know you can get quick, excellent results and then deliver. The other benefit of offering free consultations is that it is a wonderful way to fill your leads funnel. As you gain experience, you’ll be able to learn what your average close rate is. If, for example, you sell one consulting program for every five calls you do, and you want to sell four programs a month, then you’ll know you need to line up at least 20 calls each month. Simple math that will pay off with a full calendar and bank account! You might worry that people will not want to get into a sales conversation with you, but ultimately people want answers to their problems; if you can provide those answers, even in a very specific, focused way, they will get immense value from the call. Select a specific area of focus where you know you can get quick results as the topic for your consultations. Announce that you will be offering free consultations anywhere you have an audience: on your website, in your email newsletter, in Facebook groups, on LinkedIn, etc. or create an ad like above. Set a goal to do a certain number of calls in a certain time frame; for example, 20 calls in the next month. Keep track of how you do. Knowing your average “close rate” – the number of calls that turn into paying customers, versus total number of calls – will help you plan your time. If you know you close one in every five calls, and you want four clients each month, then you know you need to have 20 calls each month. Especially with consulting, customers love a one-on-one feel. Instead of sending out a blast email, consider connecting with a small group of potential clients individually. You might send them a personal email, actually pick up the phone and have a direct conversation, or – if possible – even bring them a cup of coffee. Quiet Power Strategy coach Tara Gentile calls this the “Living Room Strategy,” because you only need to fill a metaphorical room the size of your living room – not a stadium. As a consultant, @taragentile ‘s Living Room Strategy will get you all the clients you need. Speaking coach and communications rebel Michelle Mazur used this strategy for her most recent launch. She said, “I did a launch last summer, with the big launch strategy, and it was the most stressful thing I think I’ve done in my entire life, and I think I spent most of the time crying! It turned me off from doing big launches. And so, when I came up with the idea for The Speaking Collective, an exclusive public speaking mastermind group, I sent a brief, casual email to a group of people I thought would be a good fit and I also asked some of my core people, who weren’t necessarily a great fit for the program, to share it. You don’t have to push hard for the sale at this point. If you’ve chosen the people in your living room well and pointed out to them why they would be a good fit, the offer practically sells itself. I’m working on something new that I wanted to let you know about. I know you are working on your speaking and getting your message out into the world. I wanted to let you know about this experiment that I’m launching. It’s part mastermind, part group coaching program, and part community of speakers supporting speakers. I thought you might be a great fit for it (and a great add to the community) plus I’d love to work with you. No pressure. Just wanted to let you know! Make sure you’re tracking the people you’re talking to who aren’t working with you yet! It’s important to have a system set up (even if it’s just a document or spreadsheet) to keep track of potential customers so that you can reach out to them when the time comes. And ask them to check it out and let you know what they think. Tip 5: Increase Your Value to Increase Your Odds of Landing a Big Client. “There are 3 parts of being a successful freelancer – getting a client, keeping a client and charging what you are worth. It’s easy to think if you are really, really good at what you do than all three of those things will happen, but actually it isn’t true. Getting clients is about relationships. Keeping a client is about delivering reliability and consistently. And it’s only being really, really good that let’s you charge what you are worth. So if you are focussing on getting your first client, the first step is to build relationships – and you do that by providing value. A few years back I interviewed Ramit Sethi and wrote an article about it. The article was a 5,000+ word piece that was syndicated, translated and discussed all over the web. Then two things happened. First, Ramit asked me to consult for him – and became my first $20,000+ client. Second, I discovered the Hierarchy of Value. The HoV is a way of defining how much value you are providing someone. The further you move along, the more value and the higher potential return. An example of tier-1 value is sending your potential client an interesting link, or retweeting them. Helpful, but you are a tiny blip on their busy radar. An example of tier-2 value is linking to their site with a targeted keywords. Getting a valuable link online is actually pretty time consuming, so if you do this you save them hours of work. That’s worth a “thank you,” but you still aren’t in definite client territory. Tier-3 value is what really sets you apart from the masses. Now you are doing something that makes your potential client money. The Holy Grail is that before you pitch them on paid work, you’ve already done free work that earned them that entire amount. Tier-3 isn’t magic, but to pull it off you need to do have done the things that matter, 1. built a relationship by benefitting your potential customer, 2. shown off the quality of your work, and 3. shown that you can work well together. These examples are very online-entrepreneur focussed, but the principle holds true offline as well. If you haven’t already, create a list of your dream clients. Take the time to follow them on all their social media channels and look up their email address. Retweet and share their posts on social media, and when you find something that will interest them, send them a link. Put together a valuable blog post with a backlink to their site using keywords you know they are targeting. Find a way to contribute massive value to your potential customer – see the next tip for ideas. You can use the same technique above with influencers in your field, which can have a huge impact on your success. But building a real relationship almost never starts with an ask. Don’t think you can just email that big whig in your field and say, “Hey! I was wondering if you’d recommend me to your friends and clients?” It just doesn’t work that way. Instead, you approach them with an offer. Selena Soo is an expert at publicity and marketing, but more than that, she’s a genius at building relationships. She teaches that they key is to add huge value to those you admire — without looking for anything in return. When you add value from a genuine place of wanting to help, you show up as a giver in an influencer’s life (versus all the “takers” they’re constantly bombarded with). And that’s one step towards becoming an important person in their network. Selena lived this by reaching out to influencers in her field and editors from women’s and business magazines and becoming incredibly useful to them. For example, when Danielle LaPorte was launching her book, The Fire Starter Sessions, Selena offered to prepare a pitch and deliver it to O Magazine. Selena hand-delivered the pitch in a beautifully prepared box, with fire-coloured paper. Danielle was so impressed she sent Selena a thank-you email, which Selena used as a testimonial on her website, after getting Danielle’s permission. Remember, this is a long-term strategy, but the best time to get started is today! Make a list of the influencers you’d like to meet in your field. For each name, brainstorm how you might be able to help them. How can you go above and beyond to be of service to these people – without asking anything in return? Don’t just think about the people at the very top of your field; think about who you have access to and what you could potentially offer to them as well. There are several programs and apps that can help you keep track of how often you have contacted an influencer and when you should again. 22 Touch has an entire system outlined to help you keep in touch with influencers and prospects, and the extension Nimble helps you keep track of your most recent communications with someone, no matter what platform you used. When done well, many entrepreneurs will tell you that nothing converts like a speaking engagement. Being on stage lends a certain amount of credibility and gravitas to your message that little else can compete with. But it doesn’t have to be a major conference or a huge audience for speaking to reap benefits. A client of mine, brand strategist Lisa England, recently, did a 30 second pitch at a local meetup for creatives called Creative Mornings, directly after we had worked out her business concept and her offers. Because of that one 30-second pitch, she then had to put up a temporary website to cope with the interest! She got two paid clients and one barter client and it led to an important strategic partnership being formed. It was short, not terribly glamorous… but it was delivered with passion, and that makes all the difference. This 30-second pitch kick started @LisaWEngland ‘s business and got her her first paying clients! Check it out. Practice it until it’s second nature, then make a list of local meetups, networking groups, business associations – anywhere you might find your best clients – that might allow you to come and address the group. “When I first got on LinkedIn in July of 2003 (60 days after it launched), I just about fell out of my chair because I realized that LinkedIn is the world’s largest, real-time, current and accurate Rolodex. With it, you can create, nurture, and deepen business relationships—all of which leads to endless referrals. At the core for using it for your client acquisition efforts is to develop Know-Like-Trust (KLT) relationships—something most coaches and consultants don’t have plans for. Ask 100 coaches and consultants for their clearly defined strategy for developing KLT relationships, and you’ll most likely hear an eagle screech in the distance. A tumbleweed will roll by. The irony is that it’s actually so simple. Develop your KLT relationships with @LinkedIn and these tips from @KevinKnebl. Just like our parents told us when we were kids, we only have once chance to make a good first impression. You can be fully committed to being a ‘Value Generator’ and adding as much value as you can to others, but if your LinkedIn profile doesn’t clearly reflect your professionalism, you’re shooting yourself in the foot. Invest some time in optimizing your LinkedIn profile. Get a nice, smiling headshot. Put up a background picture that reflects your industry, a personal/professional interest, your company website, etc. Use the maximum space available in your headline to grab peoples’ attention. List all your contact info including email address, phone number, business mailing address, and links to your company’s website in your Contact Info. Use keywords in your Summary and Experience which will rank you higher in LinkedIn search results. Perhaps add some media to your Summary and Experience such as marketing materials, PDF’s, Excel Spreadsheets, White Papers, Word Docs and even video. Get some Recommendations from clients, current and former colleagues and bosses, which is now, called ‘Social Proof’, but in the previous century was called ‘Reputation’. When people can see that you have a proven track record of under-promising and over-delivering, your journey to new client acquisition is already half made. And have a link in your email signature to your LinkedIn profile. By using LinkedIn’s Advanced Search feature, you can identify the people we’d like to do business with with a laser-like focus we couldn’t have dreamt of not that many years ago. You can search based on geography, job title, industry, current company, previous company, seniority level, company employee size, college attended, personal interests such as golf, fishing, gourmet cooking, etc., almost down to eye color. You can save search parameters so that LinkedIn will email you when someone gets on LinkedIn or modifies their current profile to fit one of your search filters. For the savvy coach or consultant, LinkedIn is a 24/7/365 lead generation machine. Set up your search filters, click save, and go live your biz and personal life while LinkedIn is working for you while you’re sleeping. When you identify the people you’d like to do business with, take a few minutes to dig into their LinkedIn profile. They’re actually telling you everything you need to know to get in the door. This isn’t about sucking up or being a brown-noser, it’s about taking a sincere interest in people. Identify where they went to school, what professional achievements they’re proud of, common interests, etc. Then craft a simple, personal approach that shows that you’ve done your homework. Let LinkedIn’s Introduction feature show you who you already know who may be able to open the door for you. Use LinkedIn’s new Tag and Reminder features to systematize your communications. Upgrade your profile page using Kevin’s tips. Create your saved search for finding new potential customers. Use LinkedIn to research potential clients if you’re using the Briefcase Strategy, the hierarchy of value, or connecting with influencers. A high quality webinar or training can build a level of “know, like, and trust” in about an hour that is almost unreplicable using other methods. It could take years of branding and blogging etc. to reach the level that you can achieve in a really well crafted webinar. And you don’t have to include a hard sell or pitch at the end to see good results. I run a regular webinar called Find Your Business Idea & Have Clients Paying you in just 35 Days that has done extremely well for me. I run ads to generate interest, and it has no hard sell at the end. More than 80% of my sales are generated this way and up until the free consultation, it has the added advantage of being fully automated. This means that people book in with my team and I don’t need to go out looking for them. Have a captivating, results-oriented title. Mine is Find Your Niche & Start Your Online Business in 60 Days. Let people know who the training is for – so they know they are in the right place right away. Make very clear early on in the webinar exactly what people will learn and why it is so relevant to them. Tell your personal story. Let them know why they should listen to you. Give a good 30 minutes of really solid training. This can include some of the major differences in working with you as opposed to a competitor. In my training I explain why I start people working in a 1:1 capacity rather than creating e-courses – because I believe this is the fastest way to earn money, master your craft and build an audience. This is a new way of thinking for some of my audience so it grabs their attention. Choose a topic on which you can provide valuable training in about 30 minutes. Draft your presentation and include who your ideal clients are, your story, and what makes you different from the competition. Decide if you will direct people to an offer or a free consultation. A good rule of thumb is that offers under a few hundred dollars can be pitched well from a webinar; higher-investment offers probably need a free consultation first. SEO expert Shae Baxter proved how this method can work recently when she stopped blogging for three months. Flying in the face of much of the blogging and content marketing advice out there, Shae decided to focus on going deeper — on providing much more value — with a single post instead of going wider with many different posts. 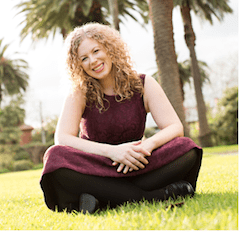 Learn how @ShaecBaxter got more traffic by blogging less! She crafted a single epic blog post on the most current theories and practices in SEO targeting a high-traffic, low competition keyword, and she has seen her organic search traffic rise by 32 percent in the three months since. “This system is about going deep to position YOU as the expert in your field – and to build trust and authority with Google… not going shallow and wider. The potential payoffs of following this system are HUGE. You have the ability to get your content shared and promoted by the influencers in your field to generate thousands of shares and mentions on competitive keywords that can send you traffic for years to come. Think about that – if you were to create content about 10 to 20 times per year that would send you traffic for popular keywords in your niche…and rank on page 1, imagine what it could do for your business? It will give you new leads, subscribers and ultimately customers. Yes there is some work in creating and promoting your content initially but this would become your competitive advantage. I don’t mean to sound blunt but most people are too dictated with their editorial calendars to follow this system or are just plain lazy. Your competition is NOT doing this. Brainstorm how you can go deeper and provide more value. This might be about examining a topic your competitors are ignoring or doing a better job covering something than they do. How can you provide more value than anyone else? Outline your post to be sure that you’re hitting all the most important points. Be sure to email friends, colleagues, and influencers individually to let them know about your post and ask them to share it. It’s a great idea to spend time in groups – on Facebook, LinkedIn, Google+ and other sites – where your ideal clients tend to hang out. But you don’t want to be the stereotypical salesperson who’s always pitching, and never listening. When you find a group that includes many ideal customers for you, commit to spending some time each week participating in the group, answering questions, and being generally as helpful as you possibly can. Only share your blog posts if they’re genuinely useful. Then, when you do have something to pitch, you’ll be much better received. My client Tina from wplaunchme.com and I used this technique with a special offer we devised for her launch week. Her first two paying clients and a waiting list of potential clients for when she gets back to work after having a baby. Research groups on the social media sites you frequent that might be hangouts for your ideal customers. You can also look beyond Facebook to forums and message boards that might attract your clientele. Schedule time each week to genuinely interact in each group, sharing your expertise, answering questions, and being as helpful as possible. Craft your pitch carefully. You can’t expect to pitch these places all the time and see good results. Create a special offer for the group with built-in urgency, like limited time or availability. I asked Video Fame Academy founder Andrea Louisa Glazier to share her experience of listening to her own intuition instead of (or in addition to) the advice of her business coach. “Often we’re advised or guided to do it a certain way because that’s what worked for someone else. For the launch of ‘Video Fame Academy’ Andrea was working with a business coach who specialises in sales funnels and marketing offers. “In the copy there was an ‘apply now’ link where those interested could apply for the program. “It was a very simple, fuss-free strategy for someone with no list. But there were a couple of red flags for me, and they wouldn’t go away. Andrea then showed the video to her business coach, who told her a shorter version was needed for the Facebook ad. “I trusted my own intuition, my own inner guidance. Even though I’d employed a fantastic business coach with a fantastic strategy that was working for me, by listening to that voice inside that said “create a video” I attracted people who were a better fit for my program, and learned more about myself and business journey. Follow your intuition like @AndreaGlazier and launch your consulting biz with these tips. maybe you already know the answer; it’s just a case of listening to your inner guidance and trusting yourself. Sit down and give yourself 10 minutes to freewrite, starting with the words “I am…” Don’t edit or censor yourself, and don’t stop until the 10 minutes are up. This kind of exercise can be very freeing and help you get clarity around whatever sticking points you may be coming up against. Which of these tips will you implement in your business today? Leave a comment below to let me know and give yourself a little public accountability. Don’t let another day go by when you could be building up your online consulting business. What Skills Do You Need To Run An Online Business? ← Is it Too Late to Start a Business? Wow. This post is PACKED with info – I don’t even know where to start! I am focusing on #11 right now – hanging out in groups and developing the reputation of someone who offers free, helpful advice. Thank you for your tremendous effort!!! I am exactly at this stage now, trying to get my 1st client. So useful!!! Hooray! Perfect timing then :-) Let me know how you go! Thanks so much, Cat! This is one of those epic articles you talk about! When I refer it to friends, I will tell them to read #12 first. You’ve done so well here, I am very impressed! Such great tips. I have a big to do list now Cat. Thanks so much. I appreciate you providing some tips on how to win a client in case you plan to put up a consulting business online such as offering free consultations. One way for you to gain the trust of your clients is by offering them free consultations since you’re only starting out. You may want to provide some recommendations or even do an actual demonstration online regarding a specific area of expertise. This way, you are able to make a good first impression on these people and they would eventually keep coming back to you for additional consultation. If I were to become a business consultant myself, I would definitely take this into account. Thanks. Your Business, Your Rules – The Book. The What, How & Some Behind The Scenes.